I’m going to make some adjustments to that definition. You knew I would. Some folks argue that I’ve got things out of order. They think communication should precede connection. The reason I put connection before communication is because the level of communication I’m talking about doesn’t happen unless a connection is first established. For example, you encounter somebody at a chance meeting. You exchange pleasantries, but for some reason, you don’t enjoy the meeting. You don’t like this person. They’re just not your cup of tea. Yes, you’ve communicated, but without forming any meaningful connection. Contrast that with another chance encounter. After the initial small talk, you’re drawn to this person. They’re drawn to you. The chemistry is working and you find yourself deep in conversation, exchanging thoughts, opinions, and ideas. In both cases, there was communication – small talk. But in the former, the connection just didn’t stick. In the later, things clicked. As leaders, we must connect if we have any hope of effective communication. Now you understand why we began yesterday with compassion. Your leadership, fueled by compassion, has the best opportunity to forge deep enough connection so you can truly serve people. I’m not suggesting that every person on your team becomes your best friend. Or that you become their best friend. But I am suggesting – even pushing you – to make sure you provide an environment where people feel safe with you. Safe enough to trust you. Safe enough to speak up and speak out. Safe enough to know you truly want them to succeed. If that safety doesn’t exist then everything stomps down right here. Your leadership will not move forward. It’ll only be a matter of time before things catch up with you. But if you’ll do this work. Till the soil of the hearts of the people you serve (and lead) and watch them grow. Connection demands truth, trust, and transparency. That’s why connection and communication go so congruent with one another. And why they may be best viewed as 2a and 2b. Be human. Don’t be afraid to reveal yourself to the people you hope to serve. It’s leadership. That means you have to go first. Too many leaders mistake forcing others to go first. They want people to open up to them about things, but they’re unwilling to open themselves up. It doesn’t work that way. You can’t remain super guarded around people hoping they’ll be vulnerable with you. It’s a reciprocal behavior that requires you to make the first step. Be bold. At some point we’ll talk about the prerequisite for all these Cs – it’s another C word, courage. Embrace the courage to show yourself to be a good human being. Connection precedes communication because I’m putting the burden where it belongs. On us as leaders! It’s up to us to get this thing going forward. That means you’re going to have to trust before you ask for or get trust in return. This trips up many leaders and wrecks their success. They simply can’t or won’t trust first. They demand people earn trust without ever stopping to think it’s a 2-way street. A leader who isn’t trusted is doomed. Don’t violate the trust of the people you serve. Step out there and give trust first. You have no path forward until you do. Head trash will prevent you. You’ll recall many times when people have let you down. Your cynicism will soar. You’ll hear voices telling you how only weak people do it. There will be a million idiotic reasons why you’ll try to talk yourself out of giving trust first. They’re all wrong. Fool’s gold. Fake. Don’t just ask the question. Answer it. What’s the answer? The person will prove untrustworthy? Then what? How is that worse than giving trust at the outset? You see, you have nothing to lose and a whole lot to gain. Perhaps you’ve never given yourself the opportunity for that kind of gain. I’m asking you to trust me, and yourself, and your people. It’s how you’ll develop the connection necessary so you can become an outstanding leader. It won’t just transform your relationship with the team, it’ll transform you. I put them in this order intentionally. We’ll explain as we go along this week. Today we begin with compassion. Style of leadership in which the leader identifies the needed change, creates a vision to guide the change through inspiration, and executes the change with the commitment of the members of the group. Let’s personalize it a bit more though. We’re going to start with YOU and your leadership. Transformation begins with you, but that doesn’t mean you’re broken and need to be fixed. I tire of people who approach life – including leadership and business – from that viewpoint. I understand that some people are better at stuff than others. Some are more effective. Some are more impactful. Some more accomplished. But we all know there are plenty of ways to achieve success and find the results we’re chasing. There isn’t just one way. Study any handful of successful leaders you care to and you’ll likely see a variety of different styles and tactics. So before we dive into the first C, compassion, let’s focus a bit on self-awareness. There are a variety of tools and assessments to help us. Some put the emphasis on our personality type. Others on our current strengths or talents. Still others on qualities and characteristics like values and beliefs. Many of these have their place as we dive more deeply into our lives to see ourselves more accurately. I’m increasingly fascinated by looking at our value strengths. Namely, the beliefs and character strengths that drive our decisions and behaviors. Learning more about these helps us better understand our current default behaviors. These may change over time, too. They often do because we’re constantly learning, understanding and growing. Self-awareness can be among the toughest work you’ll ever do. But it can also be the most profitable, too. I encourage you to spend the time to do this work because this podcast – and my work – takes aim at helping people live their best life. Yes, the focus is on business building and leadership, but those aren’t the only elements of your life. You’re a whole person. It’s important for you to commit to making all areas of your life shine. Now, let’s talk about compassion, the foundation of it all. Leaders who commit themselves to growth in this area are poised for extraordinary transformation. Consider it extreme growth. For your life and leadership to be truly transformational…you need this foundation. We all have room for improvement. I hope you’ve got a great start, but if you don’t – then make up your mind you’re going to change this. It was in the early 1970s when I first heard the phrase, “servant leadership.” It seemed ridiculous to me at the time and I was just starting a career in sales as a high schooler. I thought it was redundant. Now that I’m an experienced, mature person…I know it’s redundant. Leadership that doesn’t focus on the welfare of others isn’t leadership. It’s tyranny, autocracy and colossally selfish. But that’s not YOU. How can we grow our compassion? Simple. Not easy, but simple. Focus more on others and what you can do to help them. Empathy is a necessary component. It’s the ability to understand and share the feelings of another person. Let’s lean heavily into that understanding part. This is a big step we can all make toward growing our compassion – working harder to understand others. Pointedly, it means taking the time to fuel your curiosity instead of jumping to a conclusion or assumption without evidence. Think about the worst moment of your life. Did that moment properly characterize you, the whole you? Not likely. Now think about the best moment of your life. Did that moment properly characterize the whole you? No, of course not. We’ve all had times like these where people misjudged us. Sometimes harshly. And without even a modest query. It’s easy to draw conclusions that may make us feel better, but we can get it wrong about the other person. No compassion. No understanding. Just judgment. A lack of understanding. A lack of empathy. Start the habit of giving grace to people. This doesn’t mean you operate your life or your business without incorporating accountability. It means you work harder to understand who they are, how they feel and what really happened. This is why I’m fanatical about evidence-based leadership. It’s just too easy for us to judge people and situations without really knowing the facts. The gap between what we know and what we don’t is most often filled with harsh judgment that is incorrect. But it can make us feel better about ourselves. Superior even. Tap the brakes. Make inquiries. That means you actually ask questions and listen so you can better understand. Understanding without kindness isn’t compassion. My bias is that I’m a Christian. That whole “do unto others as you’d have them do unto you” means something. Walking in the shoes of the other person, however you choose to view it, can spark greater kindness. You’ll have to behave with higher intention and purpose. That’s going to be the hard part. To resist the knee-jerk conclusions and emotions long enough so you can behave more purposefully. Transformational leadership doesn’t happen accidentally. So this process is a complete winner all the way around. You engage higher intentionality. You grow your ability and skills to seek better understanding. You reach more accurate conclusions. You behave with greater kindness to others. You grow as a leader. Your team members gain a much more effective leader. There are no losers in this process! Confidence doesn’t always stem from competence. A little kid jumps on a bicycle for the first time. He is incompetent at riding a bike because he’s never done it. But that temporary incompetence doesn’t hinder him from holding a strong belief (and desire) to master it. Gauge the frustration of your organization or team. There can be multiple sources driving it. Frequently teams are frustrated because they can’t see what the leader sees. Perhaps it’s due to the poor communication from the leader to put effective language to the vision or task. Maybe it’s due to a lack of organization within the team and people aren’t sure what they’re supposed to do. Largely I see ineffective, frustrated teams with low confidence. The chaos might be summed up in the fact that the team lacks a plan. Plans can be rough “back of the napkin” affairs. Or they can be minutely detailed tomes that rival War & Peace (laboriously long and wordy). Few things can elevate a team’s confidence more effectively than a well-crafted and well-communicated plan. So it’s about more than having a plan, but don’t underestimate the power of confidence within your team – and don’t underestimate the ability of a plan to accomplish that. Let’s walk through some ideas to help you push forward. Forget the “going it alone” deal. This is about engaging your team and elevating the confidence necessary to get the job done. Let the troops in on this part of the process of planning. What are we going to accomplish? Make sure you’re really dialed in on the goal. It may (or may not) be what you initially think. Or there may be some other goals that need to be accomplished first. This is why having the team involved upfront can serve to get things off to a great start. Scrutinize the objective until you’re solid that you’ve got it right. This includes specificity. For example, we want to grow revenues 8% this month isn’t a plan. The objective requires details that answer the question, “How?” At this stage, it can be basic, but there must be an answer to how the team can get this done! Waze displays your next move, not your next dozen moves. When the app first came out I would scroll to see further ahead because I wanted to know what route she was going to take me. I soon gave up that habit because my trust in Waze increased. And I always knew I’d get sufficient notice before my next turn. Map out the plan. Go ahead and figure out as many steps or moves as you’d like. Just know that the further down the road you go, things may come up to alter your course. So lock and load the first few moves – the ones you’ll have to make no matter what happens. At least the ones you think you’ll have to make regardless. What are the roadmap markers you’ll use to gauge the progress? Figure them out. How will you know you’re moving in the right direction? Unlike Waze, your plan and roadmap may not provide the most time-efficient path. Waze saves you time. Time is money, but it’s not always possible to figure out a path that’s fast. And in business, the fast path isn’t always the most profitable or best for long-term success. The very next steps and the mile markers that demonstrate you’re on track…that’s the focus at this step. Again, like step 1…this is best done with the collective, your team. Step 3 – Everybody, keep your eyes on the road. It pays to pay attention. The team is moving forward toward the objective. The plan is underway. Constant feedback says things are moving along nicely or it may indicate there’s a bottleneck up ahead. It’s another reason why the power of the collective is so strong. The more eyes on the road the better the awareness of how things are going. There’s a secret sub-step to this step 3. Open eyes serve no purpose if all the mouths are closed. The team needs to understand the value of speaking up (or speaking out). If team members spot something that looks like trouble to them, but they’re too fearful to speak up…then you’ve got bigger troubles. You’ve got troubles on top of coming troubles. Make it safe for folks to report what they see as you travel together. Step 4 – Commit to course corrections quickly. Teamwork always pays off more than individual effort. Every member is responsible to advance the project (the plan). Each person has their part to play, their contribution to the whole. There are advantages to having teammates capable of spotting things you might miss. And your ability to see things they may miss…that’s highly valuable, too. It’s the difference in driving around knowing you have no blindspots versus fearing what you can’t see around you. We’re driving back home from across town the other day. Up ahead is a sea of brake lights on the highway. Oops! Time to fire up Waze to see if we can figure out a way around this mess. By the time I got Waze launched we had just passed an exit, she told us to take in order to turn around. We missed our possible course correction by mere seconds. It cost us some time. In our organizations, failure to course correct quickly enough can cost us more than time. Money, people and a host of other things can be on the line if we keep going down the wrong path too far. There’s another team benefit to fast course correction. The team sees the commitment to advance. They realize the importance of achieving the goal…and doing it together. Course correction is attributed to the team’s willingness to do this together. Like passengers in a car – like all of us in the car the other day, facing a sea of tail lights on the highway – we were all going together. It didn’t matter that one person was driving (leading). We were all on the journey together. So it is with your team. Step 5 – Celebrate all along the way. Acknowledge the work of people at every opportunity. Instill into the team the truth that if you’re end of the boat sinks, so does mine. A “we’re all in this together” culture is the responsibility of you, the leader AND every member of the team. Guard it as the precious resource that it is. The team’s reliance on one another coupled with their commitment to the objective is urgent and valuable. It’s the difference in getting to where you want to go, or ending up somewhere you’d rather not be. Recognition is important. Give people credit. Give the team credit. Pour as much fuel on success as you can. Measure success by appropriate behavior and performance to advance the initiative. Celebrate it. It’ll grow the team’s confidence in their ability to reach the goal. Confident teams working together are hard to defeat. If they’re resilient enough to push through adversity, they can be nearly impossible to beat. And it feeds on itself. Members of such a team are happy and grow increasingly more committed to the team. They don’t want to leave it because being part of it is so rewarding. Fulfilling. The Dallas Stars’ hockey club under first-year NHL coach Jim Montgomery (Monty) are in the Stanley Cup playoffs. They’ve been missing the playoffs in recent years. That’s why the Stars nabbed Monty from the college ranks. He was a successful collegiate coach with the University of Denver. They won the NCAA championship in 2017. He’s a new breed of professional sports coach. Like Sean McVay of the Los Angeles Rams. It’s not an age thing as much as it’s a team or collaboration thing. Bill Belichick is a guy who gets it, too. And he’s old. If a coach making a third or less than his most talented players can understand the value of the collective – and how important it is for that collective (the team) to grow in confidence – then surely you and I can figure this out, too. On Tuesday Inc. magazine published an article by columnist Betsy Mikel (I’m a fan of her work) about what Google discovered about high achieving teams. Google’s manager of the People Innovation Lab conducted a 2-year study involving 5,600 Google employees. She also conducted focus groups with about 100 employees. 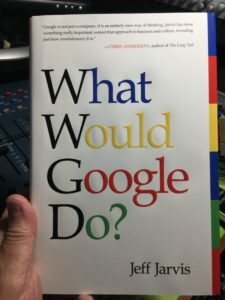 On April 4, 2019 Veronica Gilrane, the manager, published her findings on the Google blog. The study discovered 3 specific things that tight-knit, productive teams do differently. I’m curious what you think about their findings. First, they allow and even encourage mindless chit chat. What with open office concepts where workers don headphones, and increasingly remote workers…there are fewer and fewer spontaneous conversations. When you don’t have chance encounters with co-workers you have fewer opportunities to get to know each other. Many organizations have meeting intensive cultures. Leaders may think it best to hit the ground running in the meeting by jumping straight into the agenda. It’s easy to think you’ll be considerate of everybody’s time by diving directly into the hard business at hand. The problem is that sometimes we’re pushing for productivity when the team needs time to bond. A few beginning minutes spent answering the question, “What did you do this weekend?” can foster a deeper understanding among teammates. It helps employees see each other as people and not merely co-workers. It can be helpful to arrive early to the meeting (whether it’s an in-person or virtual) so time can be spent in idle chit chat. Turns out, that chit chat isn’t so idle. It builds relationships. Second, they switch up the time for recurring meetings. At Google 30% of their meetings involve teammates in two or more time zones. That means some team members may be staying late at work, while others are getting up very early. If your team is spread out it’s impossible to find meeting times that conveniently accommodate everybody. Rather than impose on the same people’s schedule each time, mix things up and let everybody take a turn at staying late or getting up early. Quite simply, this is an act of kindness and consideration. If you don’t manage remote teams, you can likely leverage this tactic by implementing those qualities in your work environment. Nothing trumps kindness and consideration. Third, Google discovered that in video meetings it’s important for members to use their words and their face. Video conferencing platforms are very good these days (and continuing to get better). Most of us understand the value of muting our microphones when we’re not talking. The problem is people don’t always know if we’re engaged or not. We can be on video calls and notice people are doing other things. It makes for unengaged conversation. I’ll also give a shout out to the kids over at Basecamp who wrote a book entitled, REMOTE: Office Not Required. It’s another great resource if you’re considering a remote workforce. What I like about this Google study is the practical “this is what we do” nature of it. Scholars and academians enjoy complicating things. Google proves that execution is practical. Easy? Not necessarily, but doable if leadership will lead and if people will understand where and how they fit in the business. Jarvis chronicles 40 rules employed at Google. Some are counter-intuitive. Others innovative. It’s worth reading to escape whatever box may contain your current thinking. I’m not urging you to ask that question so you can make direct application to your business. Let’s face it, you’re not Google, but looking at a behemoth manage 10,000 employees spread across 150 cities is bound to have value. The broader lesson may be the value derived from outside perspectives. We’re all steeped in our own industries. We read the same trade material, admire those who are at the top of our field and largely…we’re drawn to follow the leader. That leads to a lot of copycat behavior where innovation stagnates. It doesn’t foster bold courage to try something different – something that may just catapult us to a new height of achievement.